For years, my wife has wanted a fountain outside as she likes the sound of the water falling. I’ve bought her table top ones and even a cheap plastic one we had in our living room. The biggest problem was the pump was a bit loud and the water sound didn’t cover it. This weekend, my wife decided that she wanted an outdoor fountain. This became our (my) weekend project. 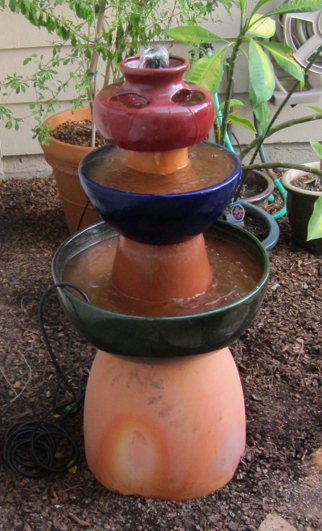 In this post, I’ll outline the procedure I used to make the fountain. I, of course, take no responsibility for your significant other bugging you to make a fountain or for any injuries (mental or physical) sustained by undertaking this project. Ensure that you really want to undertake this. Spending $200 on a decent fountain may be worth your time and money. Building your own takes time and isn’t necessarily cheap. Make sure that Home Depot (or other home improvement store) is less than 20 minutes away. If not, stop here as you will need to make repeated trips. It only took me 5 trips. Have significant other do the research and figure out what he/she wants. Allocate a full weekend for this project. A three day weekend is best as those trips back and forth to Home Depot take a lot of time. Install weatherproof outdoor outlet cover. This should be pretty easy, but for me, I had to cut out some siding to make it fit. Buy terra cotta pots and bowls. See picture to the right for what we chose. It took a significant amount of time for my wife to decide on what she wanted. Originally she wanted a resin whiskey barrel as the base and then didn’t know what she wanted and then we went to the Canyon Pottery which has a huge selection of pots and bowls. Determine where the fountain will be. You don’t want to move it after you start. Place largest terra cotta pot on the bottom upside down. Level it (very important). Plug hole in largest bowl. Use plumbers putty and whatever other means necessary. Place largest bowl on top and level it. Use Dremel to carve a notch in the second largest terra cotta pot so that the pump cord can go through it. Also, use the Dremel to put maybe 8-12 holes in the top rim of the pot. These holes let water get to the pump. The pump MUST be completely submersed in water in order to function. Attach short piece of hose from pump to an extension pipe that comes with the nozzle kit. Place pump in largest bowl. Place second largest terra cotta pot in the largest bowl and feed the extension pipe up through the hole in the pot. Level terra cotta pot. Note that if you can’t level it, you may have to use the Dremel to grind down one edge of the pot. Place second largest bowl on top and thread the pipe through. You may have to use the round file to make the hole a little larger to make the pipe fit. Use plumbers putty to seal around the pipe that comes up through the bowl. Attach second piece of pipe that comes with nozzle kit to the pipe that is coming up. Place third largest terra cotta upside down in bowl and make sure the pipe comes up through it. Place top bowl on the pot and thread the pipe through it. You may have to use the round file to make it fit. Use plumbers putty to seal around the pipe. Put the nozzle on top of the pipe. Fill all the bowls with water.